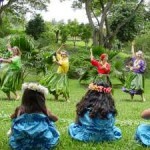 This year’s hoike was held at the beautiful National Botanical Gardens in Lawai. Early Saturday morning Toni, Kawai’s husband, his friends and halau-members prepared the ground and put up tents under a shady Monkeypot Tree. 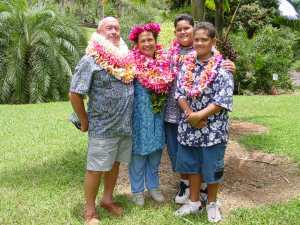 Soon many family members arrived, including our special guests Roselle and Jim Bailey from Maui, and two of their grandsons from Samoa. 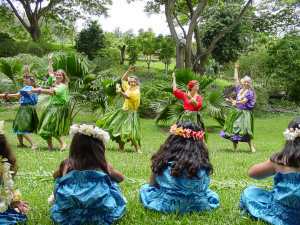 Our Kahiko program began with a formal genealogy-chant, followed by the entrance-dance for the dancers and ‘Auhea Wale Ana Ho’i Oe E Ka Wai Ilihai Onaona’, invoking Ka`ahumanu, the great chiefess of Maui, who counted among her several husbands King Kamehameha I. 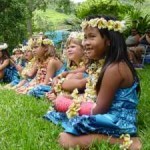 In ‘Aia I Ka Maile Ko Lei Nani’, a hula noho, we honored Kaumuali`i’s descendant Kapi`olani. Until as recently as the early twentieth century, people of Kaua`i’s Na Pali region celebrated visits from high chiefs by hurling flaming logs of light woods like hau and papala from Makana, Kamaile and other pinnacles. This dance dramatized that greeting ceremony. With the lament of ‘Ke Kanikau Na Kiamanu O Moloka’i’ we told the story about the extinction of the native birds like the `o`onumuku from which the Moloka`i kiamanu (bird-catchers) derived their living. It also laments the greed and stupidity of the kiamanu themselves, who, in the mid nineteenth century, discovered how much more convenient it was to shoot the birds with the kikapu (rifle), rather to catch them in the time-consuming and inefficient ways of old – ways that had allowed the numbers of birds and bird-catchers to remain stable for generations. Too late the kiamanu realized what they had done. Encoded in this sad mele is a promise that, when people learn how to live in harmony with nature, the birds will once more fill the forest. 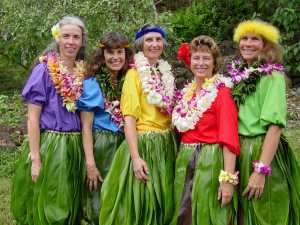 To ensure the continuity of earth, people and human society, we ended the first part of our performance with a hula ma`i, called ‘Kananaka’, in which the mo`o are enjoying themselves in the surf and moonlight. It was then time to introduce our young students from ages 5 to 10, whom Kawai started to teach beginning in March of this year. 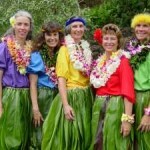 With only three month of hula-experience the keikies did very fine performances of ‘Hawaiian Rainbow’, Miloli`i, and ‘Lilo & Stitch’. 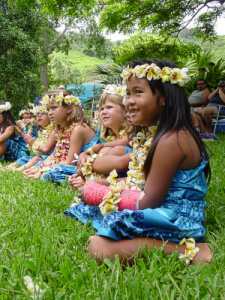 Both parents, guests and halau members enjoyed the lovely movements and smiles. We’re so happy to have our new members! 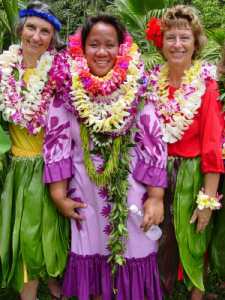 The Auana-portion of the program was rounded off with ‘Green Rose Hula’, ‘Uina’ and ‘Ho`ola Lahui Hawaii’ with Roselle joining us. And as a final dance we invited old-time students from the audience, as well as our hula-sisters from Jesse Keakawaiola’s halau to join us in ‘Puamana’. But this was not the end of our hoike. No, it was not! 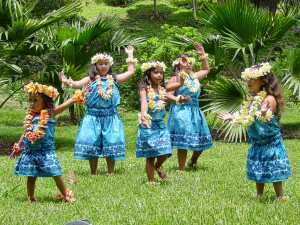 Because this year we had a special surprise for our Kumu Kawai – a new dance that Keahi had choreographed to the song of ‘Ka Wai O Namolokama’, which is the famous big waterfall at Hanalei and of course part of the name of our teacher Kawaiolaonamolokama. It was great fun to perform this dance to the fast and lively recording of ‘The Music Of Wai`oli’, sung by the Choir of the Wai`0li Hui`ia Church. By the smile on Kawai’s face, we could tell that she enjoyed it very much. Well, it has surely happened now, as an expression of our deep-felt appreciation for all that Kawai does for us as our Kumu. 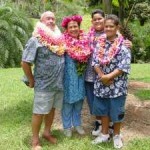 We’re especially thankful to her for encouraging new blossoms to bloom on the ancient hula-tree!